The European Wave and Tidal Energy Conference 2011 organised by the Sustainable Energy Research Group of the University of Southampton had around 500 attendees, 220 papers presented, 4 symposia and 5 workshops and an integrated social programme. The event, which took place over five days ( 5 – 9 Sep 2011), occurs every two years and provides a global focus for all activities in wave and marine current energy conversion technologies, research, development and demonstration. This year’s event was chaired by AbuBakr S. Bahaj, Professor of Sustainable Energy at the University of Southampton, and included a proclamation from the Governor of Hawaii, as well as opening ceremony talks by UK’s Secretary of State for Energy and Climate Change Chris Huhne and the Southampton Test MP Dr Alan Whitehead. The EWTEC2011 Management Committee would like to thank all delegates, authors, members of Parliament, reviewers, exhibitors, sponsors, presenters and speakers for their contributions and support. Below follows a brief conference summary. For more detailed information please refer to the official conference handbook. During the conference opening ceremony the delegates were welcomed by the EWTEC2011 Conference Chair Prof AbuBakr Bahaj and were addressed by the Secretary of State for the Department of Energy and Climate Change Chris Huhne MP, the Chairman of PRASEG Dr Alan Whitehead MP, the University of Southampton’s Deputy Vice-Chancellor Prof Debora Humphris and the Governor of Hawaii’s representative Cynthia Thielen. A video recording of the opening ceremony is available here. The opening ceremony was followed by the first three technical sessions covering both wave and tidal energy. During the late afternoon two symposia were held simultaneously. 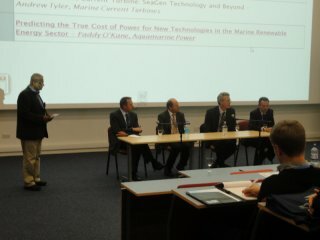 The first was focused on UK wave and tidal energy policy, while the second showcased the US’ marine energy activities. The evening saw a welcome reception social gathering during which the delegates were officially welcomed to the City of Southampton by the Mayor of Southampton and his wife. The second day of the conference focused entirely on further oral technical sessions and the first technical poster session during which 20 posters were exhibited and discussed. Some company workshops in the late afternoon concluded the day. Wednesday saw the continuation of both oral and poster technical presentations as well as a further symposium which showcased the UK’s marine energy activities, with contributions from Rolls Royce Energy Systems, Pelamis Wave Power, Marine Current Turbines and Aquamarine Power. The evening was rounded off by the official Conference Banquet, held at the Botleigh Grange Hotel. During the banquet the locations for the 10th and 11th EWTEC conferences were announced, the first being Aalborg University, Denmark in 2013 and the second being the Ecole Centrale de Nantes, France in 2015. The fourth day of the conference observed the continuation of the three parallel technical sessions, followed by EWTEC2011’s fourth and final symposium in the late afternoon chaired by George Eustice, MP. At the symposium various European Marine Energy Parks / Test Centres were introduced and discussed. These were the Portugese Pilot Zone, the UK’s Wave Hub, Sweden’s Lysekil Research site, the UK’s EMEC site, Spain’s BIMEP and France’s SEM-REV. All symposium presentations are available here. The evening concluded with a Curry Reception and entertainment at the University’s Staff Social Centre. During the conference closing ceremony on Friday morning, the conference chair, Prof AbuBakr Bahaj, summarised and reflected on the week’s achievements. The three best paper presentation awards went to Ian Milne (University of Auckland), Aurelien Babarit (École Central de Nantes) and Luke McEwen (Gurit UK ltd). 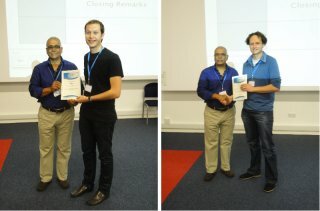 Tim Divett (NIWA/University of Otago) was awarded the prize of best poster presentation while the Yoshio Masuda prize was given to Rico Hansen (Aalborg University). The session concluded by presentations for future conferences. The first related to the next EWTEC in the series, the 10th European Wave and Tidal Energy Conference, to be held in September 2013 in Aalborg, Denmark, introduced by Lucia Margheritini from Aalborg University. The second was related to the next International Conference on Ocean Energy (ICOE) held in Dublin 17-19 October 2012., introduced by Eoin Sweeney from the Sustainable Energy Authority of Ireland.